Drew McWeeny from HitFix.com reports Liam Neeson filmed a scene for the highly-anticipated follow up to “The Dark Knight” on Monday. No doubt reprising his role as Ra’s al Ghul, Neeson was spotted in London. However, on Tuesday he was at the re-opening of the revamped Broadway musical “Spiderman: Turn Off the Dark” in New York. Hitfix, which broke the story, has no further information on whether Neeson will return to London for more scenes. Either way, what has been reported so far is fantastic news and pretty much solidifies guesses Marion Cotillard will play Talia al Ghul. Warner Bros. will neither confirm nor deny the story, stating doing so is against policy as far as Nolan’s projects are concerned. What are your thoughts on this bit of news? 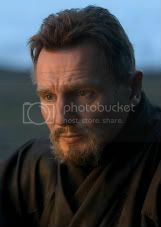 As for me, I think Neeson as Ra’s al Ghul will be featured in a flashback. Please share your speculations to the right. Tags: "Batman", "The Dark Knight Rises", Christopher Nolan, DC Comics, Liam Neeson, Warner Bros.